The FamilySearch Family Tree integrated a relationship calculator or chart into its person profiles some time ago, but I just used it for the first time. "Family Tree can trace your relationship to an ancestor up to 15 generations. It will show a path based on the accuracy of the data in Family Tree." 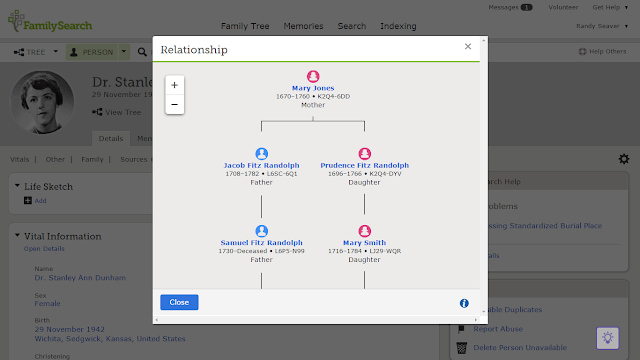 The common ancestor in the FamilySearch Family Tree is Mary Jones (1670-1760). Her husband is Samuel Fitz Randolph (1668-1754), whom she married in 1693. 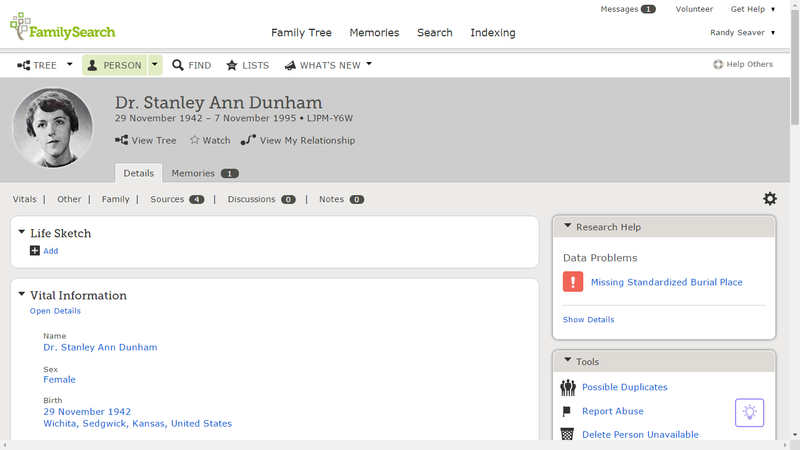 The Relationship Chart doesn't tell me what my relationship is to Stanley Ann Dunham. I had to figure that out for myself. We are 8th cousins if the information in the Family Tree is correct. Therefore, I am an 8th cousin once removed to the President through this relationship. * This Relationship Chart finds only the closest relationship between the two profiles. 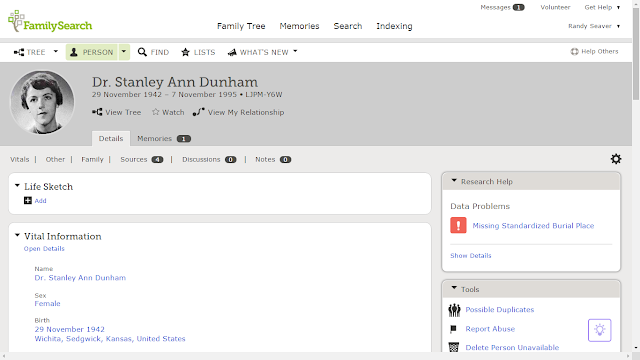 I have at least two other ancestral lines to Stanley Dunham, but this one is the closest relationship. * Why does the relationship chart not show the spouses of the common ancestor? The spouse is also a direct ancestor of the two profiles in many cases. * The relationships in the Relationship Chart for each generation are provided as ancestors on my line up to Mary Jones, and as descendants on Stanley's line down from Mary Jones. I think it would be better to list the persons in the two lines as descendants relative to the common ancestor. In other words, my relationship to Mary Jones is as 7th great-grandson and Stanley's is as 7th great-granddaughter. * Unfortunately, FamilySearch doesn't provide a way to download or print out the Relationship chart above. I wish they would. Thanks for writing about this tool, Randy. I hadn't known about it, and it was fun to play with. You can print it by using the "Prt Scr" Print Screen button on your keyboard. I love this feature of my Relationships. Thanks for posting it.